they can be separated into two twin beds! made from filler products, plywood, particle board and really thin boards. Not so with our beds! We make them with solid dimensional Southern Yellow Pine. 4x4 legs, for extra-strength and stability! With our wooden slats, you won't need to use a 'bunky' board. 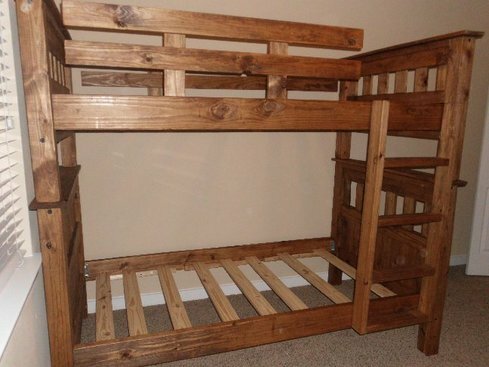 Under normal use, these beds will last a lifetime. from Twin size to King, depending on bottom bunk size. Or, you can choose to add under-bed storage drawers! We offer optional painting or staining in a wide choice of colors. or have someone that's allergic to traditional paints! to be on the top bunk/any elevated sleeping area.